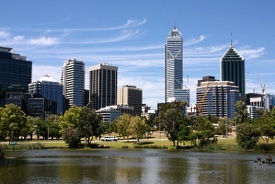 Western Australia's capital city is known for its exotic wildflowers that bloom in spring. Tourists enjoy excursions to the Pinnacles Desert and Yanchep National Park or a day of horseback riding on the beach. The nearby quaint town of Fremantle with its pubs, galleries, cafes and terraced houses is considered one of the best places Down Under for fishing, surfing and diving. Leave the airport and from Airport Dr, use the left lane to take Leach Hwy ramp. Continue onto Leach Hwy/State Route 7 for 23km, then at the roundabout, take the 2nd exit to Queen St. At the next roundabout, take the 1st exit and stay on Queen St. Turn left onto Phillimore St, keep left to continue onto Peter Hughes Dr. Then take a slight right towards Peter Hughs Dr, turn left toward Peters Huges Dr, then right onto Peter Hughes Dr to your cruise port destination.